Seymour Asses, or Seymour for short, was Fry's dog before he was frozen. Fry adopted him in August 1997 when he was barely more than a puppy. Fry had been called to a prank address (Seymour Asses, or "See more asses") and was devouring the useless pizza, when a skinny young dog begged for a piece of it. Fry was eager to share his meal, and the dog adopted him as master and started to follow him around. He acquired the name of the prank address and lived at Panucci's Pizza from then on, acting as resident dog and food taster. 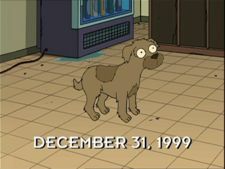 On the fateful night of 31 December, 1999, when Fry was frozen, Seymour didn't want to let him go on the delivery, but Fry told him to wait at Panucci's until he was back. Seymour started to look for Fry the following morning, and found him at Applied Cryogenics. He even managed to lead Fry's father and mother there, but they failed to realize Fry was there and dragged Seymour out again. For the rest of his life, Seymour sat outside Panucci's Pizza waiting for the return of his master, as the world around him changed and, eventually, he died in front of the abandoned pizza shop. Some time later, his body was fast-fossilized, making it possible to clone him. The outer rind was made of dolomite, a heat-resistant mineral that allowed him to survive a lava bath. When Fry learned that Seymour had lived out his life without him, he had the cloning process stopped, as he believed Seymour had forgotten him, never realizing that Seymour had been ready to spend eternity waiting for his return. In Bender's Big Score, it is revealed that Bender destroyed Panucci's Pizza, and the fire fast-fossilized Seymour into his present state. It is also revealed that while Seymour still lived to the ripe old age of 15 years outside Panucci's, he was actually attended to by a time paradox duplicate of Fry (aka Lars Fillmore) who lived in its upstairs storage room, and therefore was never actually alone. He was seen in his fossilized state at Fry's funeral in "The Sting". He had minor appearances in Bender's Big Score, when Fry and Bender travel back to the 21st century. In "A Clockwork Origin", Hermes found a fossilized dog and threw it away, believing it's "another one of Fry's dogs". In "Simpsorama", he is seen waiting when Homer, Bender, Fry and Leela pass by. However, this scene happens in Springfield. Seymour is a reference to Hachikō, a dog who waited at a train station every day for his owner. One day while at work, Hachikō's owner died, and Hachikō continued to wait at the train station. He came to the station every day appearing exactly when the train arrived every day for 9 years until he died. His death happened in 1935 and in Japan in the station there is a statue dedicated to Hachikō. It was confirmed by Adam Bohn (founder of Artix Entertainment) that this episode is a Hachikō reference. Seymour was seen lying down and presumably dying at the end of "Jurassic Bark", although his fossilized remains are always animated as standing up. This is explained (possibly retconned) in Bender's Big Score. Seymour is also seen in his fossilized state on a shelf at Planet Express in the film. Seymour made a cameo appearance in the add-on for the video game Fallout: New Vegas entitled "Lonesome Road". You can find a fossilized dog named Seymour if you have the Wild Wasteland trait. The title caption for "Stench and Stenchibility" is "Not The Episode With The Dead Dog", presumably a reference to Seymour. ^ Considering he was 15 in 2012. This page was last edited on 21 October 2015, at 21:08.